Discussion in 'The Garage' started by halfmile, Feb 12, 2019. Last week I ordered a set of control switches from one of the many Chinky company`s in Roland Heights CA that all have a different name and the same address. Under $18 for the pair and of course free shipping. I opened the package and my first thought was these look better than I expected. Larger diameter wire, nice finish, drain hole, locating pin and even heavier than I expected. The Chinamanese are getting things right for a change. Too good to be true? I then noticed the words "Domino" Made in Italy on the bottom of the switches. 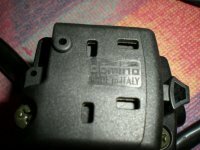 The wiring diagram (Schema Elettrico) was printed in Italian too. Well I`ve got news for em. I still have a test light and if the switches just make contact I`ll figure this out. Where else but the USA can you buy Italian parts from a Chinese seller for a Japanese bike. peanut, Superjet, Mailman and 3 others like this. The world is getting smaller by the day. You can open the switches and look where the wires go. Maybe the colors are right, Might get lucky. Do you have a link to where you bought these please? Looks good. Looks like very nice gear, let us know how they work for you. Nice looking switches, but where are you going to mount the fog light? Nice switches....too bad they dont ship to Canada we are nice people here!?! Agree Machine.........How can china import materials and make products then export to other countries and the seller can still make a profit on 2 bar switches that cost $18. They're probably designed in Italy manufactured in China, and surplus stock sold "unbranded" to third party sellers for a reduced price. I like the on/off lights option. You gotta come back to this thread and tell us what you think of them after using them for a while. I just looked at banggood to see what they had to offer. Couldn't find the combination of features that I would want. Some had no kill switch. The one set that did have everything also had the housing for a single cable throttle. So, reality just hit me. I need to make a great effort to save the switches that I have because of my dual cable throttle, even if I have to replace the throttle sleeve. A new chrome clutch lever perch may be in the future to match my new chrome MC. I should have bought the matching clutch perch when I bought the MC. Here in Aus Stuff was sold as made/produced in Australia when it was produced or made overseas...........now we have regulations that any part or goods have to clearly show the difference between Made/Manufactured in Australia or made in X country. Can we make our oem switches do on / off headlight for our high low? This post http://www.xs650.com/posts/580313/ shows my aftermarket rh switch and the wiring adjustment I had to make. Bike is still in the garage so I don't know how it's going to behave over time yet, and I haven't looked underneath to see if it's got a 'made in Italy' mark! Seems to be pretty OK though.